This is a trip down memory lane for Cleveland sports fans, with prodigal son LeBron James leading the way. An established music, arts, and culture writer, Chris Parker spent two years documenting his version of the prodigal son tale: Akron-born wunderkind LeBron James’s decision to join, spurn, and rejoin the Cleveland Cavaliers. Bringing a National Basketball Association title to a city that hadn’t celebrated a professional sports championship in decades seemed to be the only conceivable outcome. Parker went all-in on the story, becoming a Cavaliers beat writer for a local entertainment magazine, and turned two years of press row and locker room access into King James Brings the Land a Crown. James famously declared that he was taking his “talents to South Beach” to play for the Miami Heat; he also wrote, in a Sports Illustrated essay announcing his return, “My relationship with Northeast Ohio is bigger than basketball. I didn’t realize that four years ago. 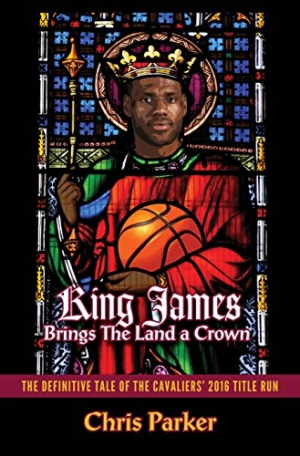 I do now.” Right from the cover—a stained-glass representation of a basketball-toting James over an Olde English font—the book hints at the biblical proportion of the 2016 championship run, even for Cleveland sports fans who once burned James’s replica jerseys in effigy. For a relative newcomer to the sports writing world, Parker does an admirable job of chronicling the championship season. The book begins at the end of a failed title bid in 2015, offers in-depth analysis of key games during the 2016 season (particularly the finals series against Golden State), and provides an adept dissection of the personnel moves that surrounded James with the right players to win a championship. It also presents provocative insiders’ takes on the circumstances surrounding—and the ultimate impact of—the firing of coach David Blatt midway through the season and examines the performance of his replacement, Tyronn Lue. With massive expectations placed on James to bring an NBA championship trophy home, Cleveland found itself trailing 3-1 in the best-of-seven championship series against a Golden State team that had set an NBA record for wins in the regular season. In describing the Cavaliers’ unlikely comeback and all the aforementioned topics, King James Brings the Land a Crown delivers on the claim made in its subtitle: The Definitive Tale of the Cavaliers’ 2016 Title Run. In form, there are a few too many play-by-play recaps and not quite enough cultural insight into the Rust Belt city ending its fifty-two-year championship drought or the nearly $500 million economic impact that some economists believe James had on the community. Those are the true prodigal son moments, more so even than James’s block of an Andre Iguodala shot with less than two minutes remaining in the seventh game of the NBA Finals. Still, King James Brings the Land a Crown does exactly what it promises: takes Cleveland fans on a trip down memory lane, from the beginning of a magical season right on through to the city’s massive championship parade.